Of the many places in Beijing to visit, Crab Island has been on my list for a long time. And last week, on a cloudy day, my friends and I decide to make that trek. From 3rd Ring Road, the cab ride was about RMB 40. It might have been less if there was no traffic, but alas, it was the weekend. To clarify, the swim area of Crab Island is called City Seaview. It is a 60,000sqm faux beach within the compound of Crab Island resort, which is 1 million square meters. The resort itself offers endless amusement: a lake with paddle boats, fishing ponds, go-karting, grassland carting, a zoo, and an "organic" farm complete with egg picking. There are two amusement parks: one with a carousel and bumper cars, the other with a big playground, aqua bumper boats and a swinging boat. Within City Seaview, or what most people refer to as Crab Island, there is a huge wave pool that fizzles out onto fake sand, which is more like dirt. So maybe it isn’t the most glamorous swimming locale. Also, I must’ve missed the memo about renting a tent – everyone seems to use them to steak out a spot. If you arrive late in the day though, there is still a space somewhere to put down your beach towel. And despite the gloomy sky, the huge body of water attached to the faux beach was full of summer kin: tossing around beach balls, floating in bright yellow tubes or just swimming about. I can imagine that on a good sunny day, it’s packed to the brim. However, it all seems safe. There are a few lifeguards about and they blow the whistle if you’re doing something you shouldn’t be, like getting too close to the wave machine. A word to the wise: to be honest, the water doesn’t look totally clean, but it’s Beijing and it’s China and it was good enough. There seemed to be a little slime at the bottom of the big pool, but once in the water, it was refreshing enough that I didn’t mind. The lazy river, on the other hand, I didn’t want to touch with a ten-foot-pole. The big pool itself does get pretty deep, so little ones can stay in the shallow end or head to the kiddie area across the way. Good news here is that the water here seems like the cleanest in the park. The kiddie area is basically a playground surrounded by ankle-deep water. There are two full play areas with slides and ladders, as well as a swing set, and tea cup-style merry-go-rounds. Adjacent to this is a small train, which kids can hop on – and oddly enough three big water slides, not intended for little kids. While the slides do not cost extra, the line is always long and does not always move along. To ride the slides, swimmers need a tube. 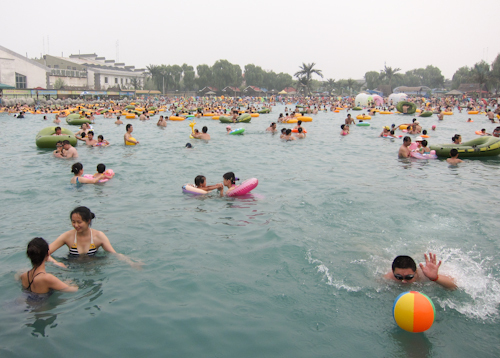 They cost RMB 10 per float with a RMB 50 deposit. Pay at the cashier and do NOT lose your receipt or your deposit card. Exchange your receipt for a tube and you’re ready to hit the waves. And be sure to store your valuables in a locker, which are available for RMB 10 (RMB 10 deposit). Next to the slides is a small play area that is by far a favorite in this water playground. It is your typical wait-under-the-bucket-until-the-water-unexpectedly-hits-you, but the water doesn’t fill up the bucket unless there are people walking on the three hamster wheel treadmills. Even if you’re too nervous to try it, it’s fun watching people anticipate the inevitable splash from an overflowing bucket above. As far as food goes, there is a nice sign at the entrance that says: Please do not bring outside food or drink. The good part is that no one inspects your bag thoroughly, so it’s easy to bring a picnic in without confiscation. Food sold inside City Seaview includes basic snacks, chuan’r and Chinese cuisine. So if that doesn’t suit your palate, be sure to pack your favorite snacks and drinks. After a few hours submerged in water, there is still plenty to do at Crab Island. My friends and I opted for a drive in a grassland go-kart. It’s RMB 20 per loop for one person and RMB 30 per loop for two people (RMB 100 deposit) and even as a passenger, it was a blast. One note: the road can get bumpy, so be sure to buckle up. Heading back home is a little tricky if you don’t have a ride, but cabs, while infrequent, come and go from the resort. At most, the wait to find one was 15 minutes. While Crab Island may not be the swimming experience you were hoping for, it is worth the trip and by the end of the day, your kids will return home, both happy and tired. Or as my friend puts it: "If I were little, I would want to come here every single day in the summer." For more on Crab Island, click here for a related article and here for the Directory.